As I write this I'm chuffed to bits that the headboard in question has just been posted on Apartment Therapy's Instagram feed. You know, no biggy, they only have A MILLION FOLLOWERS. Anyway. 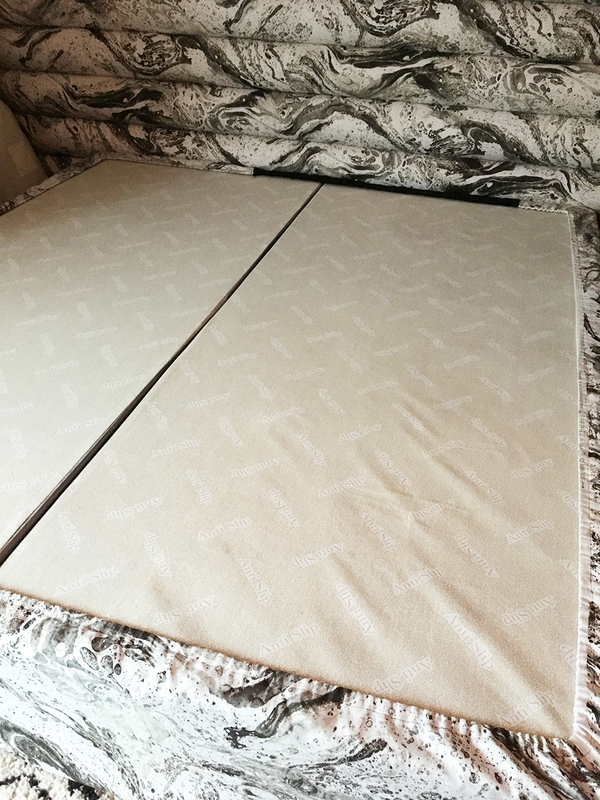 I promised a tutorial of sorts for this monster of a headboard and covered divan base, so here goes! It's a bit wordy, but helpful I hope, if you plan to make one yourself. Firstly, I am not claiming for one minute that this idea is original. I unashamedly followed the tutorial posted on Emily Hendersons amazing blog, by the also amazing Brady Tolbert. I knew the minute I saw his headboard, and indeed how doable it was, that I would one day have to attempt it myself. 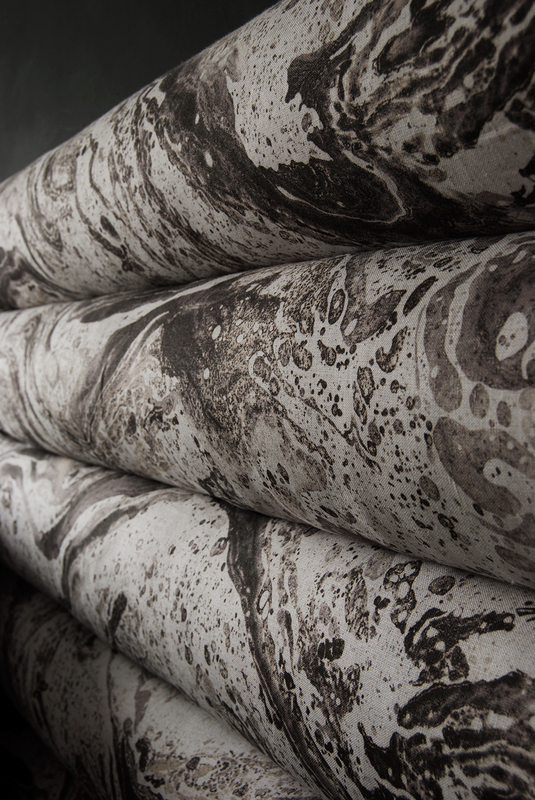 That day came pretty soon after, once I realised what an amazing match it would be with stunning linen from Earthed. A no-brainer really. So basically, I'm still kind of a genius. So why am I doing a tutorial of a tutorial? Well for starters we're not quite as spoilt for choice here in the U.K. for suppliers, so I wanted to share my UK sources, and secondly, I did a few things a little differently, so I wanted to tell you the what, why and how. 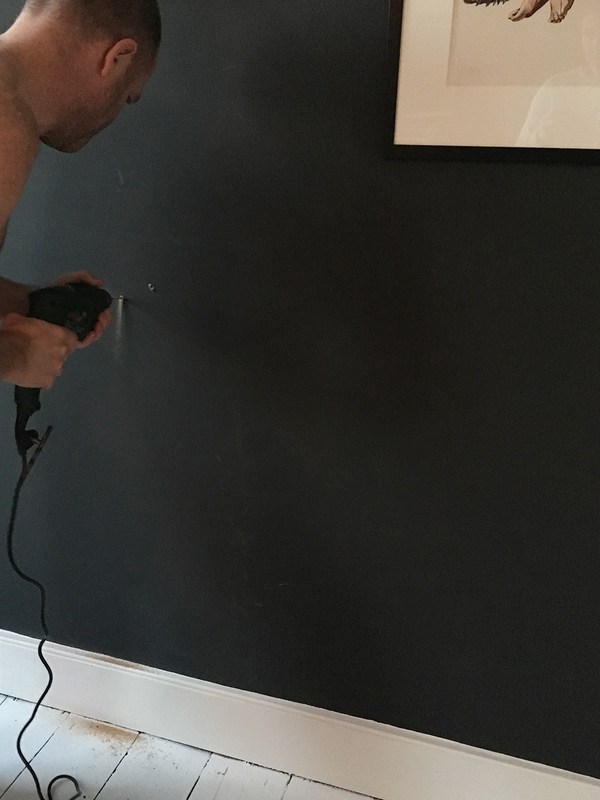 Wadding - cut to the same size as the fabric panels you will cut to cover each plank of wood. The amount of fabric you need depends on your wall width, how many panels you're going to make, and what thickness they are. Don't scrimp. I'll say now that my life would have been a lot easier and much less stressful if I'd got 14 metres instead of 10. I really didn't leave a comfortable amount of overhang for the panels, and only just had enough for the base. Do yourself a favour and get a bit more than you think you might need! 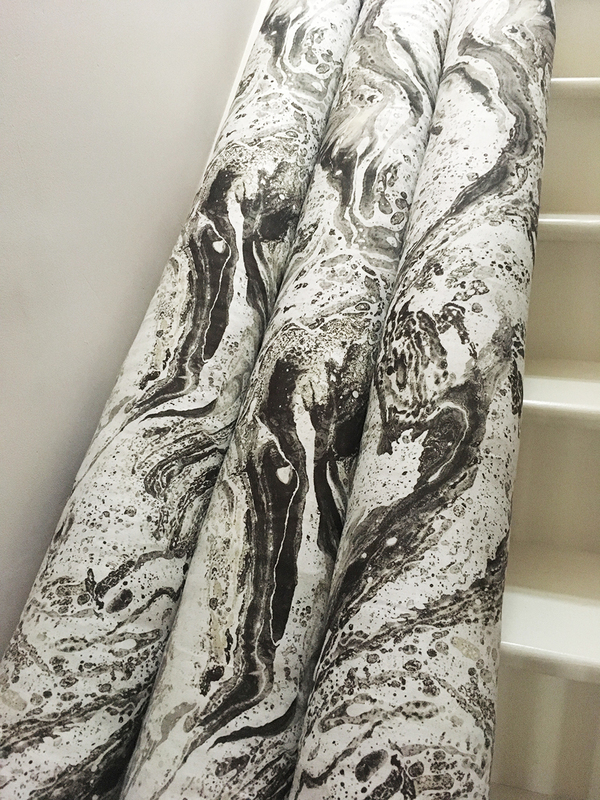 Obviously my fabric was the incredible Torrent in the Stone colourway (actually a sepia toned brown and off-white, not black and white as it tends to look in a lot of images), from the lovely people at Earthed. I ordered 'split bolsters' - cylindrical foam (150mm diameter) and had them split it down the middle. This was hard to find, and ended up costing double what I anticipated, but not six times, which is what one quote was! The longest length they had was 2m so I calculated they they would split some down the middle and leave at 2m, and others they would split down the middle and cut so that I could put one 2m length, and one 1.6m length on a plank for a perfect fit. 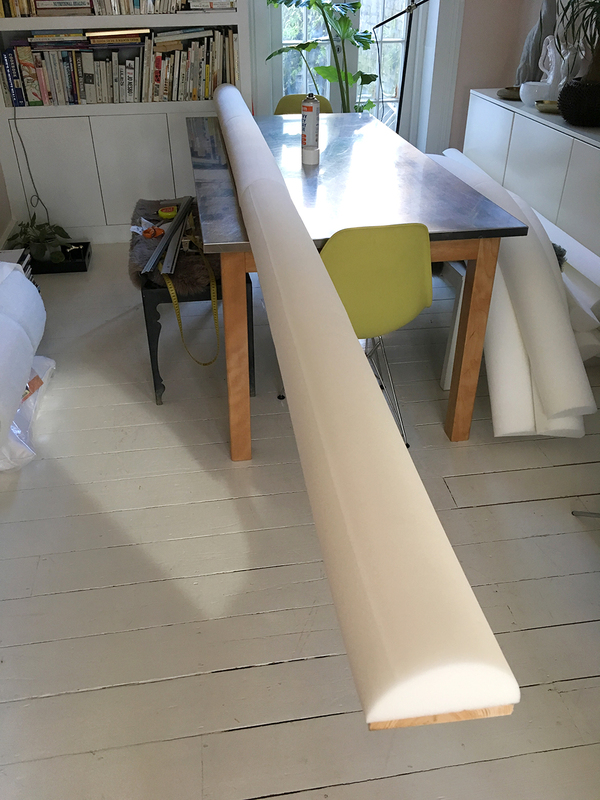 You could use flat rectangular foam to lower to cost (probably quite substantially), but the effect wouldn't be quite as spectacular, and I'm so pleased I stuck to my guns. Optional, but I think it made life much easier. I used 7oz weight. You could easily use 6oz or possibly lower. 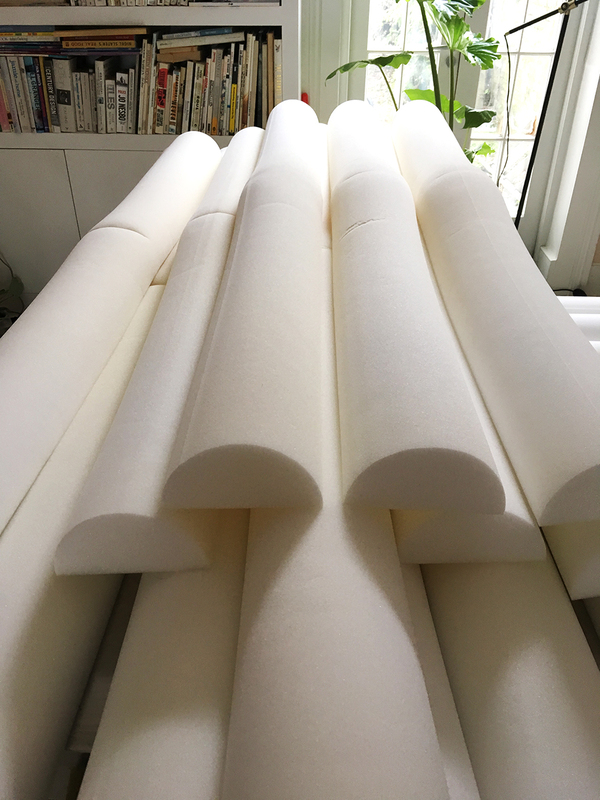 This ensures that any joins in your foam don't show and gives extra bounce and softness, while visibly softening any hard edges. I didn't do my sums properly and didn't order enough, then had to wait for more, so do you maths people! And then do it again. 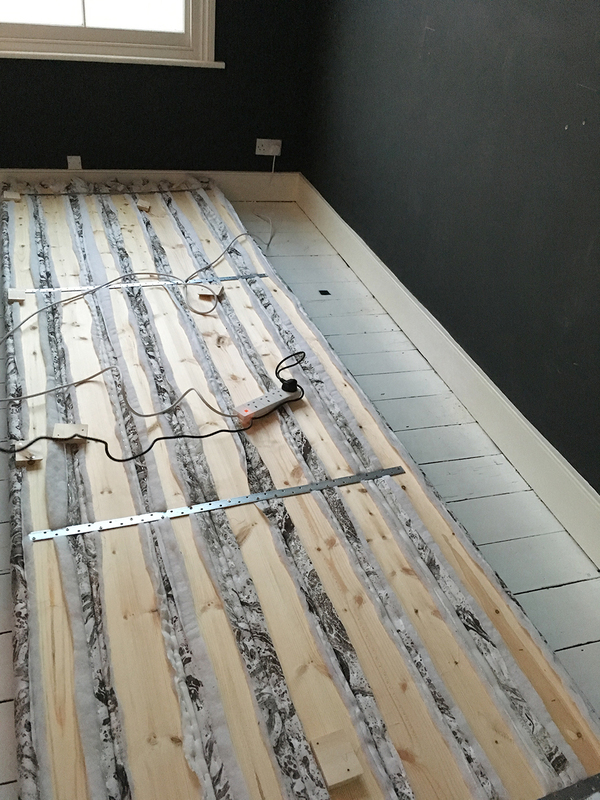 I used 7 x 3.6m lengths that were planed (no splinters, nice smooth edges) of basic cheapest pine that was approximately 15cms wide and 2cms thick. It was trickier than anticipated to find this to be delivered, and now I actually can't remember where I got it from. Will add this in asap! I had this already thought I ordered extra staples. I really wished I owned an electric staple gun, my hands couldn't do more than two panels a day, so this bit took a long time! You need this to reach across all your panels from top to bottom to connect them. 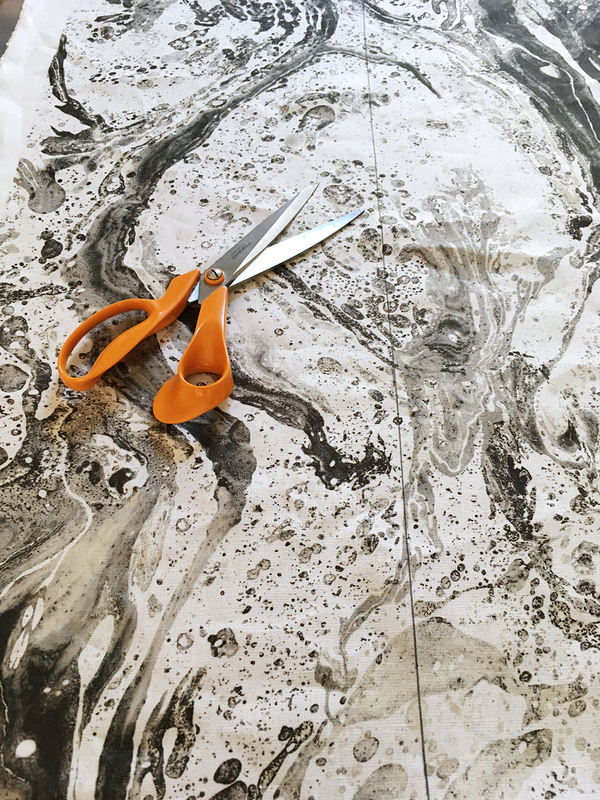 Start by cutting your strips of fabric. They need to be long enough to cover the entire length of the planks in one piece - seams will ruin the effect, but I knew that the pattern would still work effectively and beautifully running sideways. That won't always be the case, so choose wisely if you're going for a pattern! 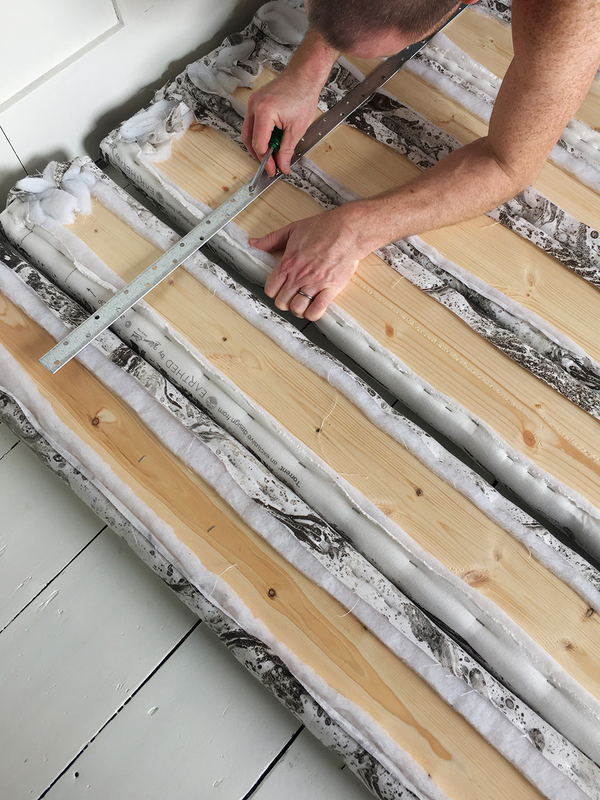 Cut your fabric panels so they are 20cms longer than your planks, and wide enough to wrap around the wood, foam and wadding. It's more than you might think, and you want a comfortable amount of overhang at the back. Not like mine with very little overhang! I realised early on I was tight on fabric so I used the selvedge because I knew it wouldn't be seen. And 'Waste Not, Want Not' as my Grandmother used to say. 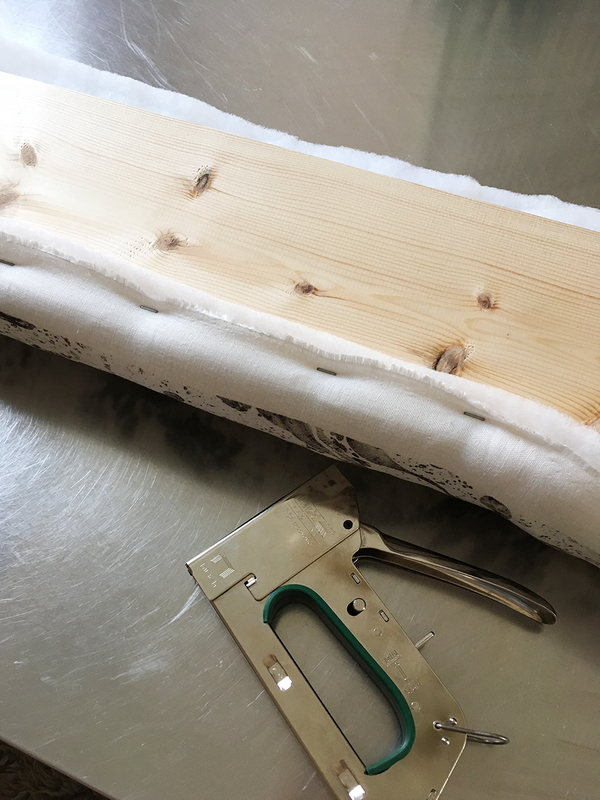 Lay your fabric on your work surface, face down, followed by the wadding (cut to the same size), then foam and wood. I used spray foam adhesive to secure the foam to the wood first so I didn't have I worry about it slipping around. I was also joining two pieces on each plank. Start stapling! I was surprised at just how many staples I needed and how long each panel took. Because I was working with linen which stretches and moves around a fair bit, I would do around 15cms worth of staples, then swap sides. I was also quite tight on fabric so I needed to be sure I wasn't favouring one side too much as I went. Leave the ends till last. You want a neat (as possible with all the bulk) fold. You need to play around with this to figure out how's best to do it, and staple to secure. I worked on the dining room table, with a chair supporting the overhang. Yes, it was cumbersome! The planks are 3.6m long so not easy to move around. I also had a momentary lapse of concentration whist manoeuvring a panel and it lost balance and came up and whacked me under the chin. Quite hard. I can laugh now at the Laurel and Hardy ridiculousness of it, but I'm aware that it could have been much worse - I could have knocked myself out, a tooth out, etc etc, so be careful! Repeat until all your panels are done. Then you need to join them together. Unless you live in a gymnasium, you'll need to do this right in front of the wall you intend to have the headboard on. Because once it's joined together, it's seven times more unruly, cumbersome and heavy! We used four evenly space light duty flat straps with nail holes, and screws, pushing the panels together for a tight fit. It does have a bit of a bend to it when lifting the headboard from the ground, but it's still really sturdy and we decided that the heavy duty version would be too heavy. 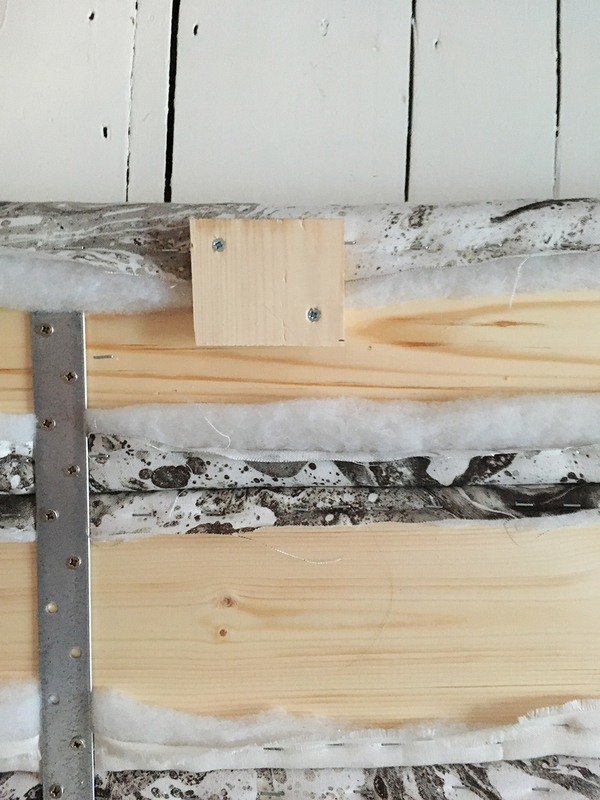 To attach to the wall, I made French Cleats from an additional plank of wood. 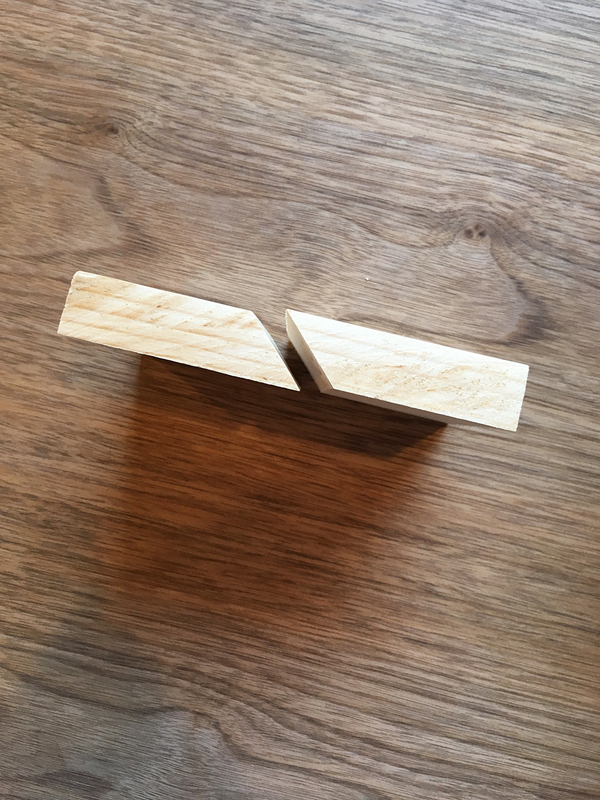 One part is screwed to the wall, its partner to the back of the headboard in the same position as the piece on the wall. Once lifted on, they lock together, and there's no movement. (Side Note: High-end framers also use this method on the back of picture frames to make sure artwork is always level and doesn't budge). We used four, spread vaguely evenly across the wall, positioned so that the headboard sits right on the floor. It's very secure and doesn't move at all. My divan base is U G L Y, and it has four ugly storage drawers. 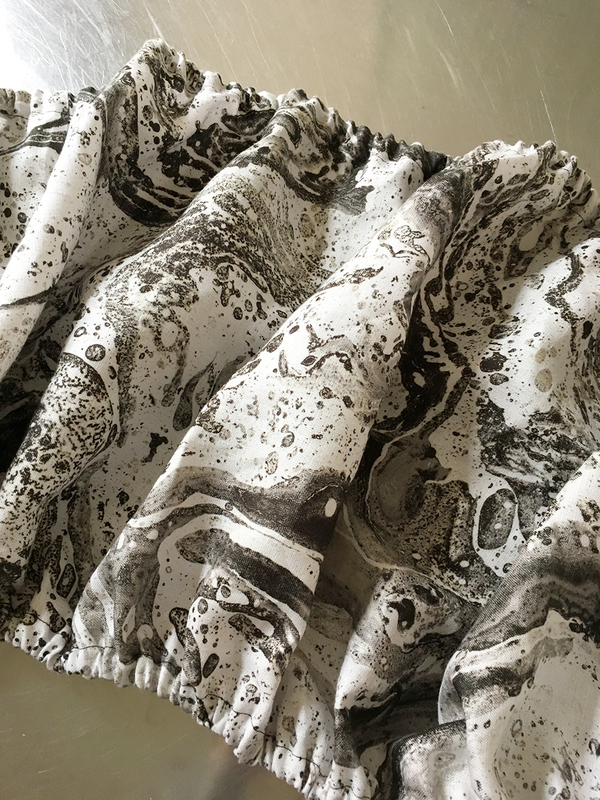 Originally I'd intended to cover it just using the staple gun, but the drawers would have been tricky, so I decided to make a giant band of fabric that I threaded elastic through the top and bottom hem of, to tighten it, to 'wrap' the base instead. This worked a treat, and we can easily access the drawers by lifting the bottom of the band up. 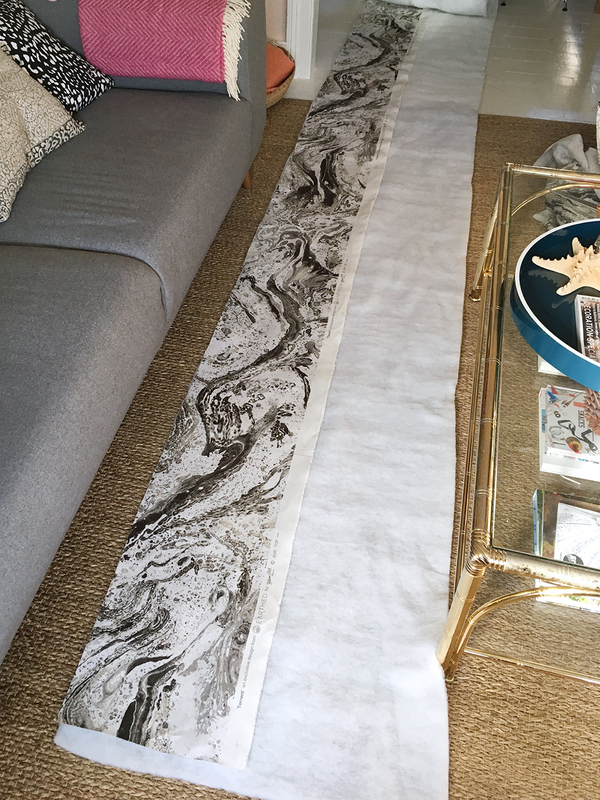 Start by making a giant strip of fabric that's approximately 20cms wider that your base. I needed to sew a few strips together to make it long enough. 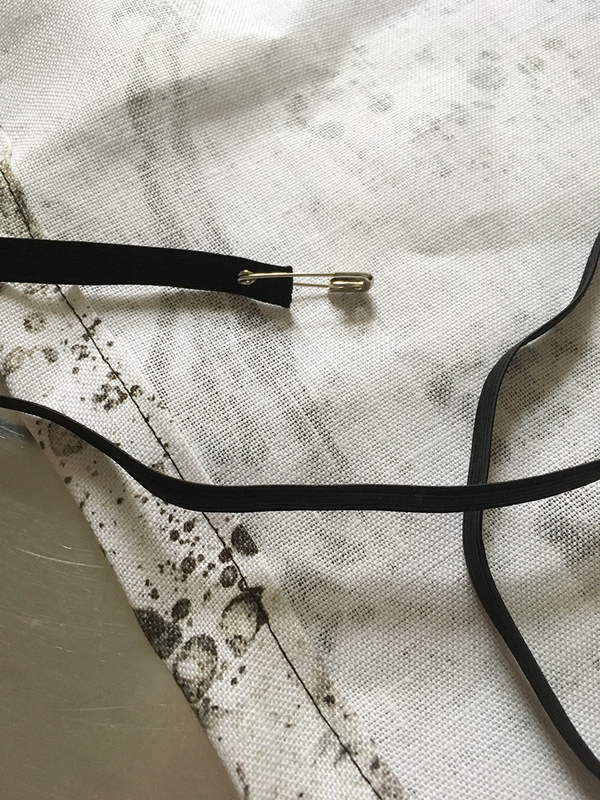 Pin it around the base and mark where you need to sew it to form a band. Sew it up and check again before hemming the top and bottom all around, and thread elastic through each hem. Slip it over your base again, and pull the elastic until you achieve the desired tension. Make sure it looks even all around and tie in a knot to secure. 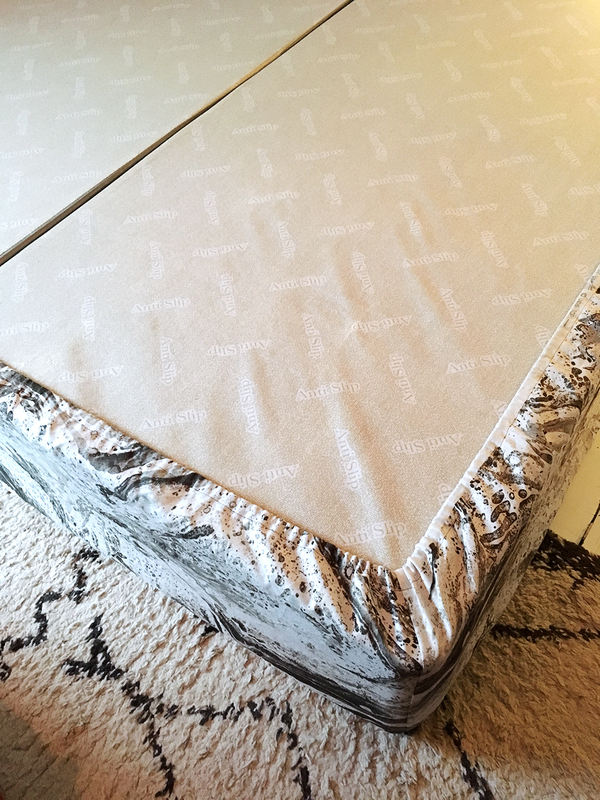 It should sit on top of the base under the mattress so you can't see the base at the corners where your mattress may not cover it, and you also shouldn't see any gathering as it will be hidden under the mattress and under the base. I left the tension a bit looser at the bottom so we could easily lift the band to access the drawers. As you may have guessed, I'm so pleased with the result, and the rest of the room is now having a makeover because it is being terribly outshone by the arrival of such a glamorous headboard, so watch this space for bedroom plans very soon! And if you missed it and would like to see more pretty picture of the finished headboard, click here, and if you have any questions, just ask in the comments below! And no, I don't iron. This is stunning!!!!!! I love your style!